A man walks by campaign posters of German Chancellor Angela Merkel and her main challenger, Martin Schulz, Frankfurt, Germany, Sept. 20, 2017 (AP photo by Michael Probst). 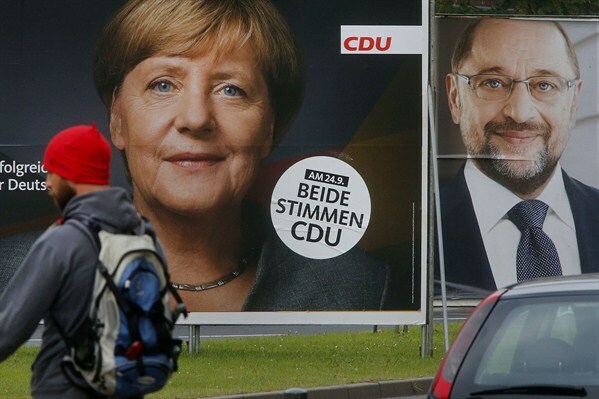 BERLIN—For weeks, Germany’s upcoming federal election has seemed like something of an anti-climax. Chancellor Angela Merkel, content to run a retrospective campaign based on her 12 years in power, appears set to cruise to another four-year term. Her center-right party’s traditional opponents on the left have found little traction in their criticism of Merkel’s record, in large part because they have spent the past four years in a governing coalition with her. Potentially divisive issues looming on the horizon have gone unaddressed.